Many Americans make a living by working as roofers in the construction industry. Being that the nature of the construction industry involves many potentially dangerous aspects, construction workers depend on their employers to comply with the measures stipulated by law that are in place to keep the workers safe. When employers do not comply, things can go very wrong. The Miami Herald reported recently that an Orlando-area roofing company has been cited by the Office of Safety and Health Administration (OSHA) for a “willful” workplace violation after an employee died from a fall this past April that OSHA has determined was preventable. In addition to a six-figure fine for the fatal roofing accident, the company was cited for not offering its employees training on fall protection safety. Employer noncompliance can lead to more accidents, which can obviously also lead to more workers’ compensation claims. Compliance is especially important for roofing companies because of the heightened level of danger of this aspect of the construction industry. One study, in examining statistics over a twenty year period, found that one-third of fall-related construction fatalities originate with falls from roofs. 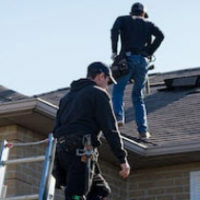 These roofing accidents are preventable in work settings, but it is important that employers and employees each understand what constitutes a safe work environment. What Are Common Ways that Roofing Falls Happen? What Can Happen as a Result of Roofing Falls? Falling off of a roof can lead to many serious results that include traumatic brain Injuries, broken bones, fractures, spinal injuries, paralysis, and even death. What Should My Employer Be Doing to Help Ensure My Safety? Your employer should also be retaining workers’ compensation insurance. In addition to being required under Florida law for many employers in Florida, this also helps ensure that any workers who are injured on the job will be able to file a claim. What Happens if I’ve Been Injured in a Roofing Accident at Work? You will probably incur expensive medical bills and be out of work for an extended time. Just as importantly, you will probably have untold emotional scars from your ordeal. You should know that workers who are injured on the job in the state of Florida are generally entitled to workers compensation benefits. An experienced workers’ compensation attorney can help you understand your rights. Have You Been Injured at Work? Allow Us to Help You in this Difficult Time. If you or someone you love has been injured while working, we can advocate for you and ensure you recover the compensation you are entitled to while you focus on recovery. The Miami workers’ compensation attorneys at Payer & Associates have significant experience helping people like you. Begin by contacting us today to schedule a free consultation.